Big ska show last weekend. Well, it was for me! I traveled all the way back to my home state of Illinois to see MU330, Coolidge, the Eclectics, a supergroup of ska musicians from the Exceptions, the Parka Kings, Ganger Fun and Rude King, Skapone and the Tango Wedding Band. I went with my little brother and it was like old times. Ska band after ska band bringing the tunes for hours! Besides hanging out with the few band members I knew, I also ran into my old friends Kip and Kate and also got to meet the boys behind the Windy City Sound System podcast! Too much fun, too much goodwill! Whew… just under the wire on getting this done on Thursday! Usually, I don’t cut it nearly this close. Hell, this is about 21 and a half hours later that I usually post these up! But I hope you enjoy it, as always I smashed a bunch of songs I’m loving this week into a small musical package for all my fellow ska fans! I hope you all enjoy! I’ll come right out and say it, I think ska music is pretty damn great. No, really, I know after nearly seven years of doing this podcast that you might doubt my commitment, but by golly, I’m in it to win it! Win what? Well your ears, my friend! To flip them on to some great ska music that you never knew you loved before! Ya can’t keep a good podcast down! 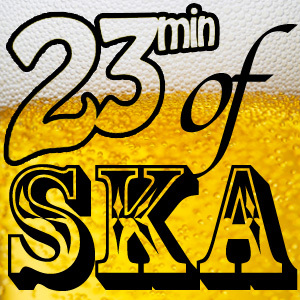 23min of Ska hitting back at you after another long week. Get prepped for that weekend, it’s gonna be fun and relaxing one. At least I hope so for your sake. We all need a respite after these last few weeks, right? Now, I’m never one to warn people away from the show, but if you’re not a ska/punk fan, eeeeee, this might not be the episode for you. Certainly there’s some straight up ska in here, but there’s some ska/punk that’s rather heavy on the punk, and just heavy in general. That’s a fair warning: this podcast plays both kinds of music, ska & ska/punk. Deal with it. Show support for the podcast by finding & liking 23min of Ska on facebook as well as follow on twitter. Also, feel free to download this episode if you wanna keep it forever. Another way to support the podcast is to buy some records from our partner in crime over at Grandpa’s Casino Recordings, they have some great vinyl ska records! Boom! Looky here! 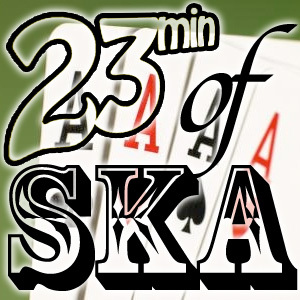 It’s a brand new episode of the 23min of Ska podcast! Chalk full of great ska music! It lasts approximately 23 minutes. Bam, nailed it again! But for real, I really dig doing this podcast. I dig ska music and putting these together each week makes me a pretty happy guy. I’ve made my main hobby in life listening to and seeking out ska music (as well as putting out ska records, go check out Grandpa’s Casino right now!) It seriously saddens me when I can’t get a new episode out, it really does. So thanks for bearing with me last week and I hope you enjoy this episode doubly to make up for the rerun last time. Some of these songs have been kicking around in my head for inclusion for quite some time, I’m glad I finally am getting the chance to play them all for you! I hope this is another episode that you can listen to and enjoy, as I know for one that I really enjoy this episode. Find & like 23min of Ska on facebook as well as follow on twitter. Also, feel free to download this episode. Ska is better on vinyl. Hit up Grandpa’s Casino Recordings, we have some great vinyl ska records!